​following, which helps to make this event extra special. 2019 will be the 7th year that the Series has made a trip to Devon and Exeter. in the Over 40’s. Natalie Lawrence made it title number 11 by taking the B Grade and Luke Bishop also from Devon and Exeter finished off an amazing day with an incredible display of skill and attacking racketball to take the A Grade final 2-0 against squash World No. 132 Rob Downer. It was only the Over 50’s and 60’s where the Series players dominated. A huge 17 player Over 50’s was eventually won by Jonathan Edwards of Nuffield Portsmouth. The Over 60’s was another big draw with Peter Eddy defeating both local legend David Mudge and 2018 Series Champion Stephen Widdison in the final decider group. 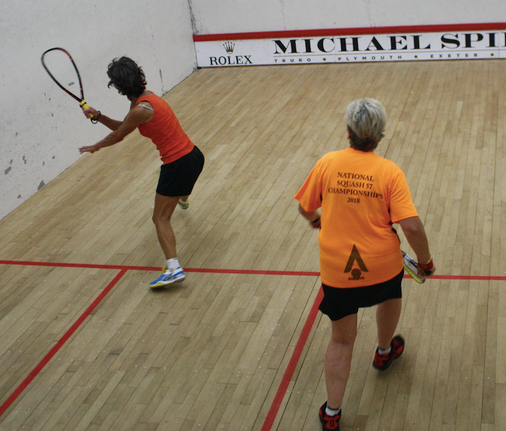 t is important to remember that UK-Racketball Series events are designed to be inclusive. Although the A grade does attract the best racketball players in the country the events really are for players of all ages and abilities. We have never had a competitor who felt they were not good enough for an event when they took part. Being a venue that caters exclusively to squash and racketball, there is a great club atmosphere; a perfect setting for this UK-Racketball Series Event. The club itself boasts six courts including a championship glass back, with the bar area situated so you can see the court conveniently from your barstool. Hot food will be served all day long; last year the food was great and was very reasonably priced. On the day, there is a racket stringing service available and a physiotherapist on hand. The club is easily accessible, being located only a couple of miles away from the M5 motorway. ​This was the 6th time the series has returned to Devon & Exeter and it was a big event with all grades running. 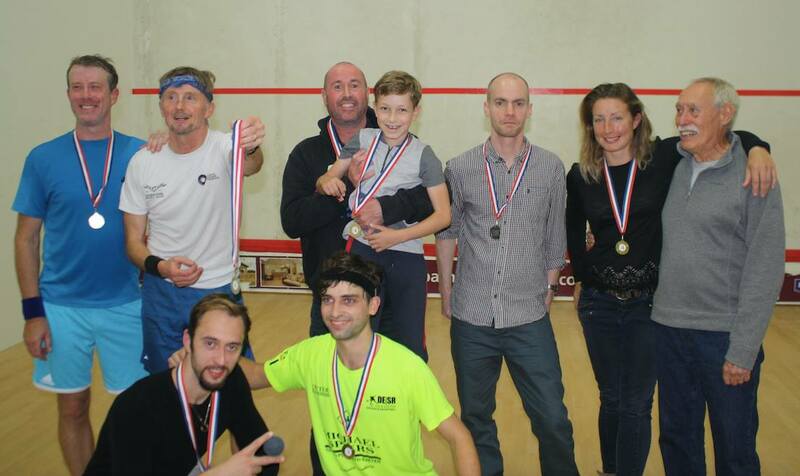 To see all the results head to http://www.uk-racketball.com/e8--devon--exeter---29th-sept.html. Laurence Ogden has added videos to his growing YouTube Racketball channel, follow this link to view, https://www.youtube.com/channel/UCOCDhogUhLhXdcGnD58Nlbw. For official photos check out the UK Racketball Facebook page. The B grades saw two big groups, both with 5 players each, meaning 4 matches needed to be won before the finals. In group A, top seed Tom Ash from Uxbridge started well coming through against Tim Baker, Martin Brook, and Sibohan Garland but came unstuck against local and England number 1, Natalie Lawrence, losing 2-0. In group B top seed Brian Sheppy was unlucky not to progress through to the final, winning all matches except against David Crookson, also from Devon & Exeter, where he was defeated 2-1. In the final, Natalie Lawrence started well against Crookson and never looked back. Accurate hitting and smooth movement gave her another title and a 2-0 victory. Matt Baker retained his title from last year with only Aron Cullingham taking him close in a 2-1. It was another big draw for the over 60s category. 3 groups of 4 meaning there would be 3 matches before the finals group, and another 2 matches to decide it. It was always going to be a long day and was one of the latest finishes. In group A, Stephen Widdison, who is currently leading the series rankings, overcame a tough group which included Andy Mitchell and Philip Clarke. A 2-0 victory against Mitchell early on set the pace but Widdison later had to save multiple match balls against Philip Clarke in one of the best games of the day. Clarke played superbly for the first two but was just unable to hang on. Widdison's grit saw him through to the next round. In group B it was local David Mudge who was able to come through, however was unfortunate to be defeated by Butler, only for Butler to be injured in a later match and was forced to withdraw. Group C, Grahame Holmes, England number 6, won his opening two matches against Chris Hawkin and Rob Cann but was unable to defeat Peter Eddy, with Eddy going through. In the finals group, Mudge was a little tired and was defeated soundly by Peter Eddy and then Stephen Widdison. The final between Widdison and Eddy was tight, Eddy coming through 2-1 to take the title. Widdison's series championship hopes stay alive. Second place gives him enough points to retain his place at the top. Top seed, Luke Bishop, looked very good in the groups. 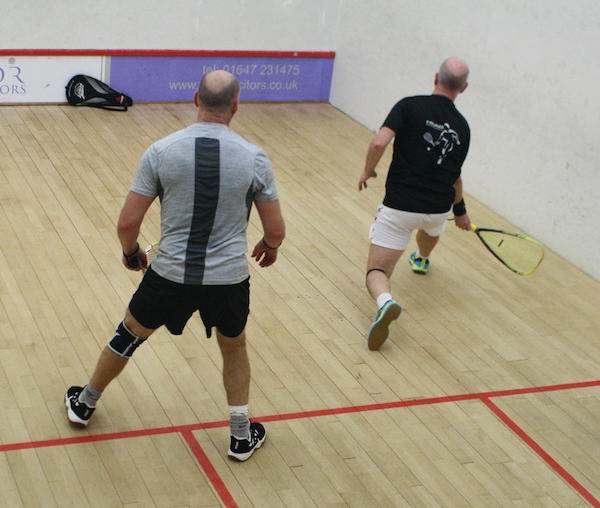 Richard Davies was solid against Philip Borrett and Adam Sindall-White. Bishop started well against Davies winning the first very comfortably and didn't look back from there. Davies' solid style and movement didn't have enough zip to get into Bishop early. In group B it came down to a battle between professional squash player Robert Downer and Wakefield runner-up, Craig Chappell. On the day Downer managed to just come through 2-1. In a much anticipated final, Bishop on home court, took the first game convincingly, 11-1. Downer rallied in the second with some fantastic retrieval and finding some winners of his own. But in the end, Bishop was just too clinical. This is one of the best displays of racketball that has taken to the courts against a professional squash player, with Bishop coming through 2-0 to retain the Devon title. He is going to be a handful for anyone when it comes to the nationals next year. Shonagh Butler defeated Sibohan Garland in a really tight 2-1 to decide group second place, but it was always going to be Natalie Lawrence who came through to add another title to her collection and solidify her position at the top of the women's rankings. Once again the over 50's was the biggest draw of the day. 4 groups all with 4 players in except for group D with 5, meaning you had to win 3 matches to reach the semis, and past the semis there was still a final. 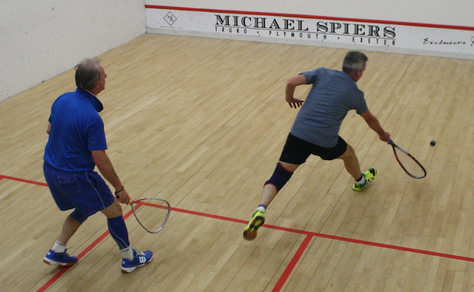 Top seed Michael Wardle, in the opening match of the day, against Nigel Bell, was defeated. This was a cracking match with a 2-0 scoreline but both games could have gone either way, with a big tie-break in the 3rd to decide it. Group B saw a two-way tie between Spencer Cooper and Jason Stanton, with Adrian Henley also defeating Stanton. However Cooper came through with 5 points and as Stanton was the winner of that tie, he progressed through to the semifinals. In Group C, Jonathan Edwards overcame Paul Dodds. Dodds was runner-up in Wakefield in the middle of the month but didn't have enough to progress through the group stage at Devon. In Group D, top seed Dan Fernandez came through with 8 points, but due to the nature of the group, he had to play one additional game- a tough draw for Dan, which might have proved crucial when he came up against Jonathan Edwards in the semi's, Edwards coming through 2-1. In the top semi-final it was Nigel Bell who defeated Jason Stanton to set up a final against Jonathan Edwards. Edwards had been very impressive all day and managed to come through 2-0 and take the title. Click here for the video's - courtesy of Lawrence Ogden.